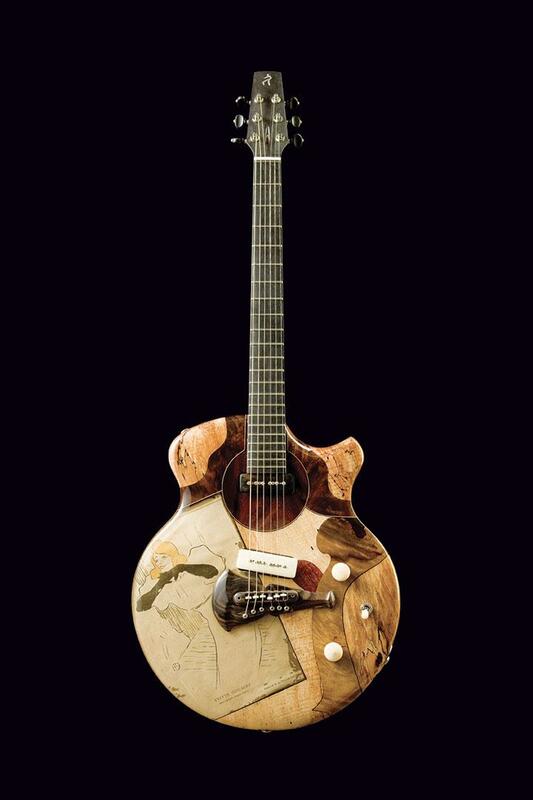 The decoration of musical instruments is a longstanding tradition in which instrument bodies serve as canvases for carved, inlaid or painted designs. While this practice continues today, it is also experiencing significant shifts. 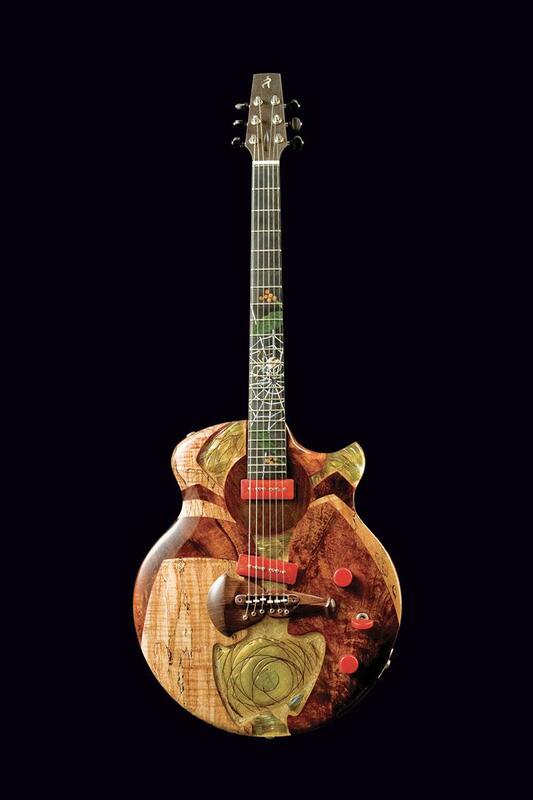 Technological advances have given artist-luthiers access to a wide variety of materials that they now incorporate, often times unconventionally, into their work. 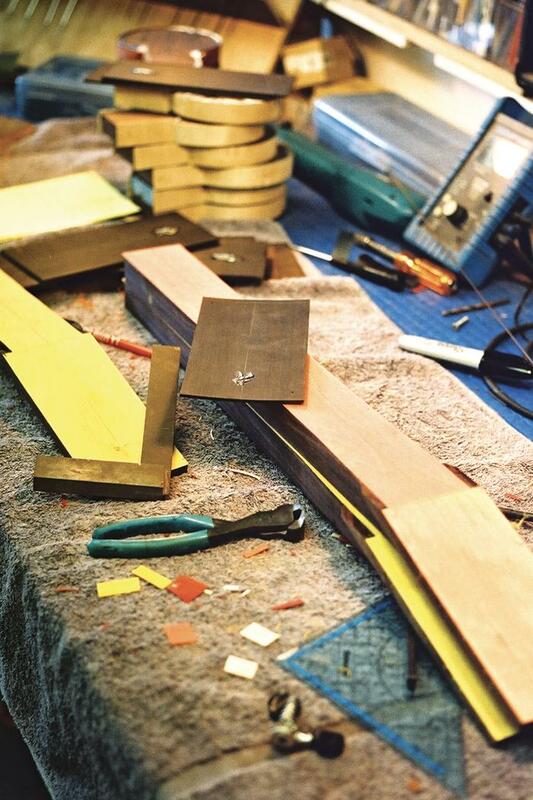 Some builders are even reconsidering the canvas itself and transforming the traditional shapes of instrument bodies. 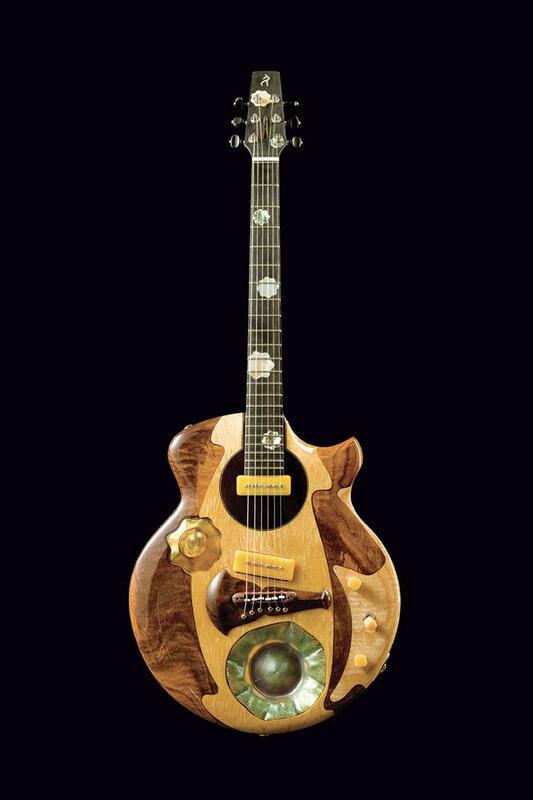 These changes, along with an ever-evolving understanding of acoustics, form the foundation of a movement that is moving away from the “decoration” of musical instruments, and toward a marriage of functionality and artistic expression. 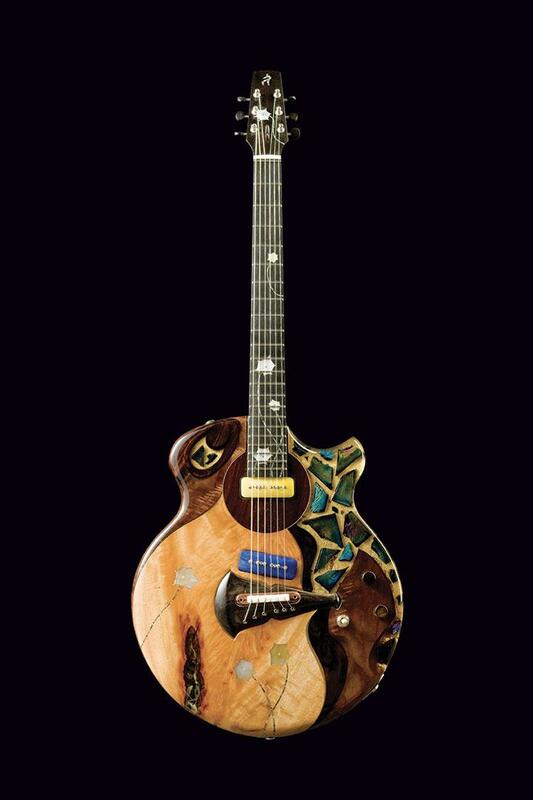 Guitar Nouveau exemplifies this trend in artistic lutherie. 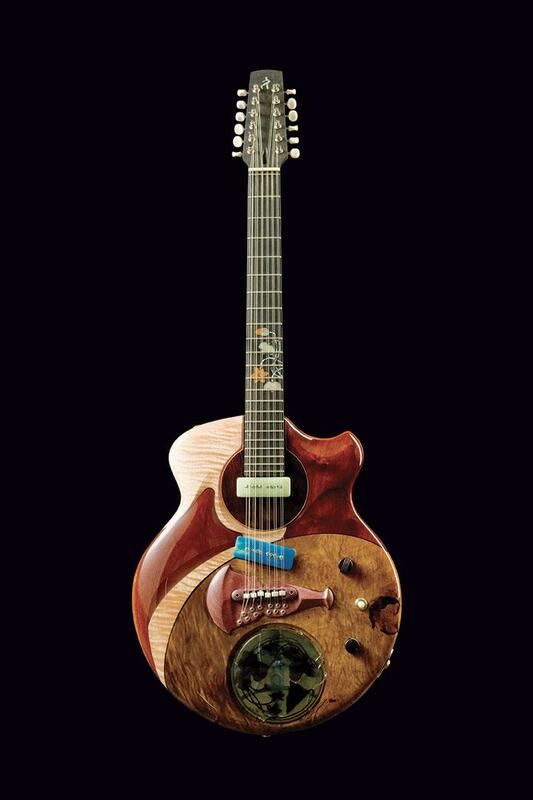 This series of 14 “boutique” guitars is the result of a creative collaboration between musician/author Paul Schmidt and luthier Michael Spalt. Schmidt carefully selected an array of work by iconic Art Nouveau masters such as Emile Gallé Alphonse Mucha, Henri de Toulouse-Lautrec and Louis C. Tiffany. 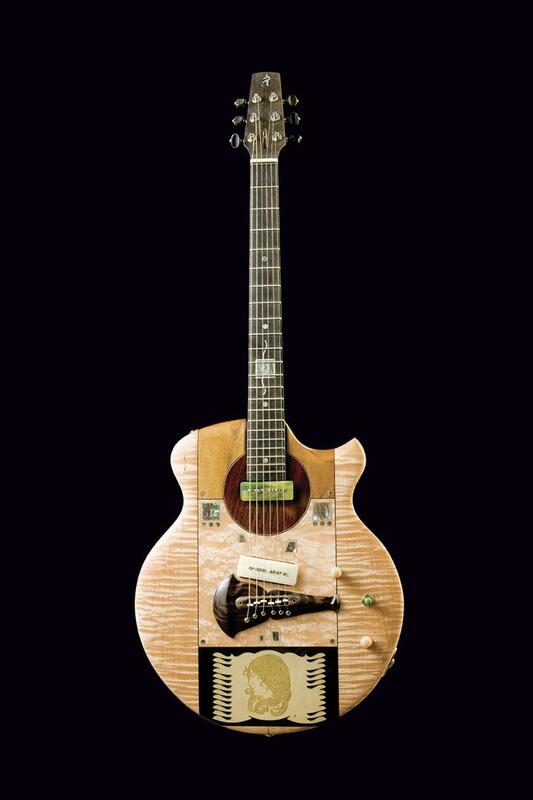 Spalt built the instruments using his knowledge of tone woods and acoustics, as well as a meticulous woodworking technique. 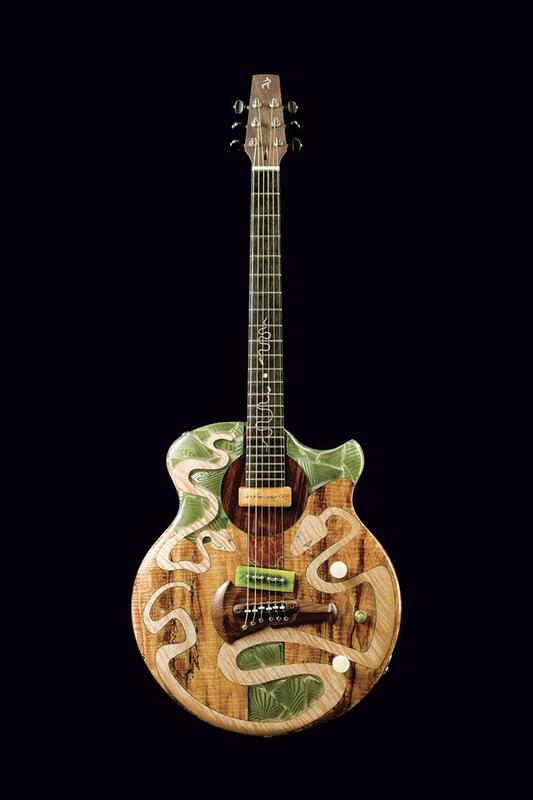 Using his formula for clear resin tops and a body style inspired by luthier Steve Klein, Spalt incorporated the artistic elements chosen by Schmidt. 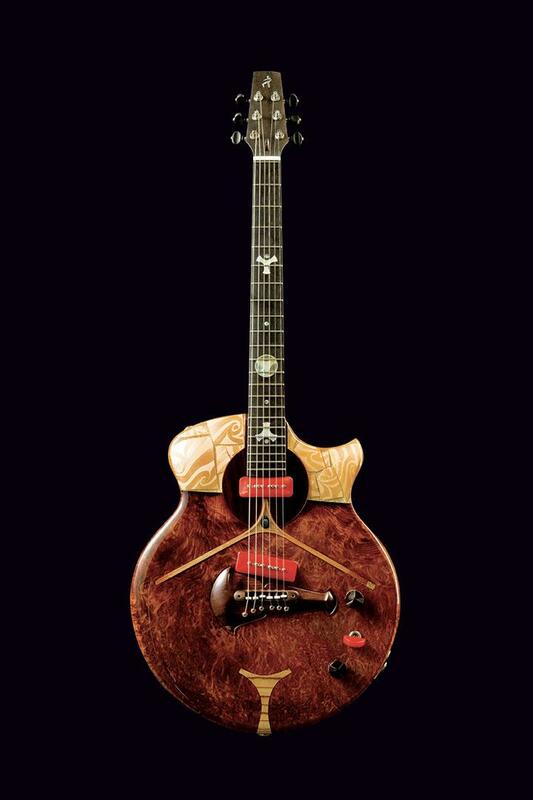 The result is a collection of one-of-a-kind instruments that are as acoustically captivating as they are visually appealing. Art Nouveau had its roots in the Arts and Crafts Movement which began in Victorian England in the middle of the 19th century by those who opposed the dehumanizing nature of Europe’s burgeoning industrialization. The identity of the Arts and Crafts Movement came from the shared principles of honesty, unity of design, and good craftsmanship that would make for beautiful handcrafted products which would re-kindle the humanness that had been stilted and stalled by the technical progresses so wholeheartedly embraced for financial gain at the expense of human development. 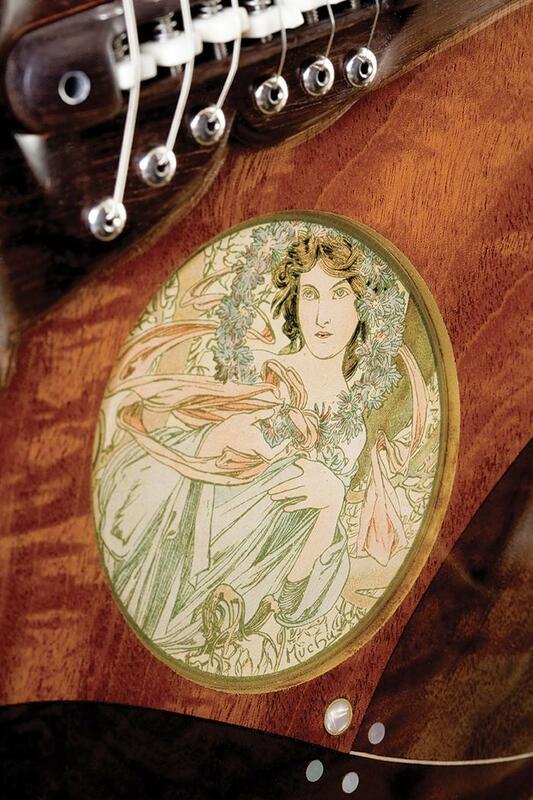 Art Nouveau also had its roots in Japanese art and culture. Japan was a closed culture from the 1640s until 1853, but as more Japanese art began making its way to Europe in the 19th century, its effect was significant. Most important was the use of nature in Japanese art, which inspired Art Nouveau-era artists as diverse as Louis Comfort Tiffany, Paul Gauguin, Gustav Klimt, Victor Horta, and Renne’ MacKintosh - all of whom collected oriental art. Leading architect of the day Henry Van deVelde noted, “It took the power of the Japanese line, the force of its rhythms and accents, to arouse and influence us.” The curvilinear and strong linear designs of Japanese art, along with its articulation of space, simultaneously animated, charmed and breathed life into what was to become Art Nouveau. 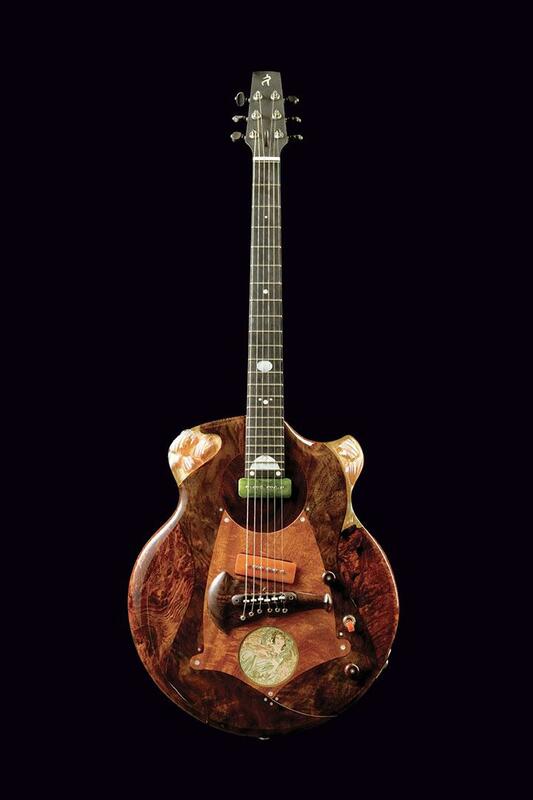 Paul Schmidt explains: “I had long been a fan of Steve Klein’s guitars and when Steve and I co-curated an exhibit of guitars for the Sonoma Valley Museum of Art in 2001, I learned of Michael Spalt’s guitars. Both Steve and I thought his designs were at once artful and amazing. 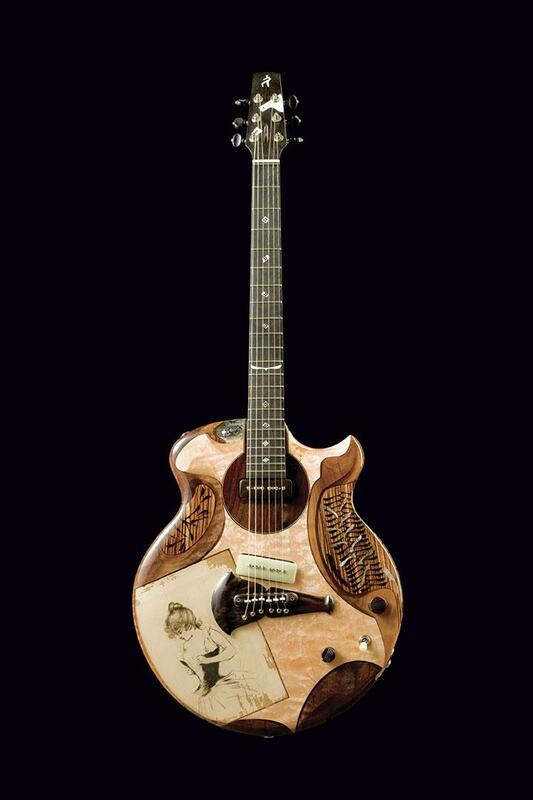 I then had the notion to see if the design of Steve’s smaller-bodied acoustic could generalize to an electric guitar, and thought it would unite beautifully with Michael’s artistry. 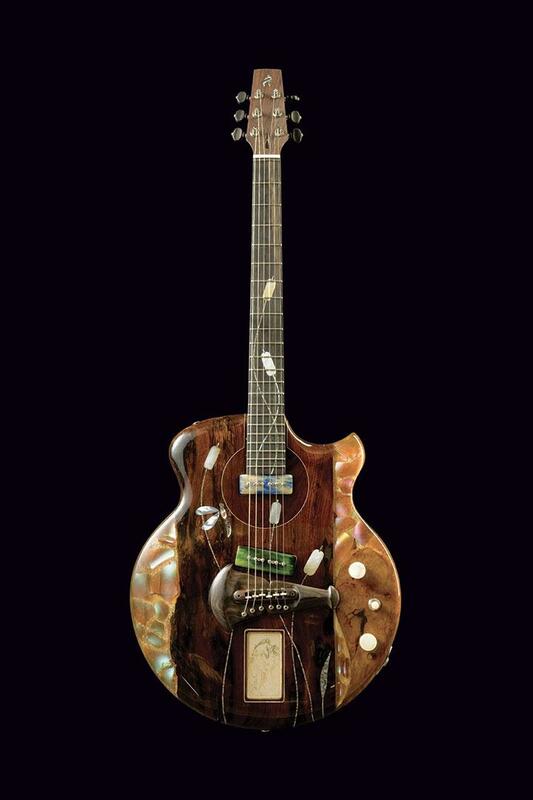 I took an original Klein neck and had Michael make a body comprised of parts from Klein’s shop from the past thirty years collaged in his unique resin-topped style. 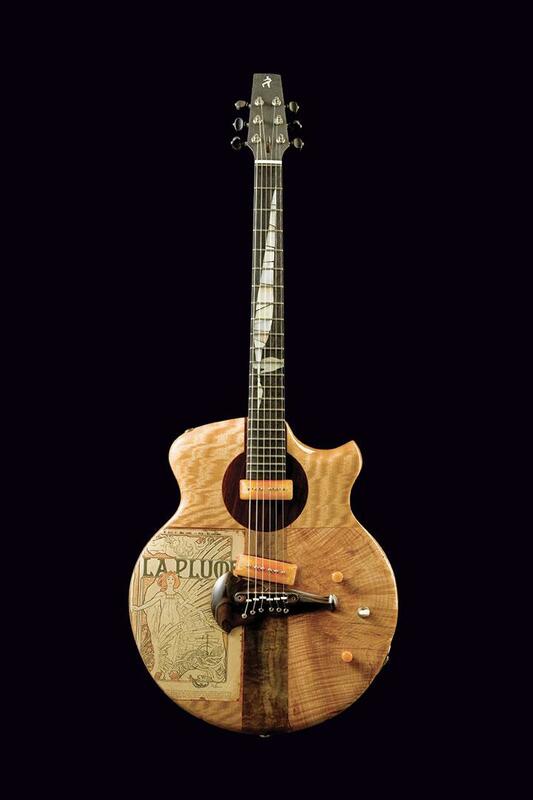 The instrument turned out beautifully and we featured it in the book about Steve (p. 77 in the Klein book). Then, while studying the history of Tiffany stained glass I came across an interesting anecdote about how Siegfried Bing (early champion of Art Nouveau in France and owner of Maison del l’Art Nouveu - the gallery that featured artists that worked in the style preceding the turn of the 20th century) commissioned Louis Comfort Tiffany (originator of Tiffany stained glass) to produce ten windows to designs by nine of France’s leading artists including Toulouse-Lautrec and Pierre Bonnard. 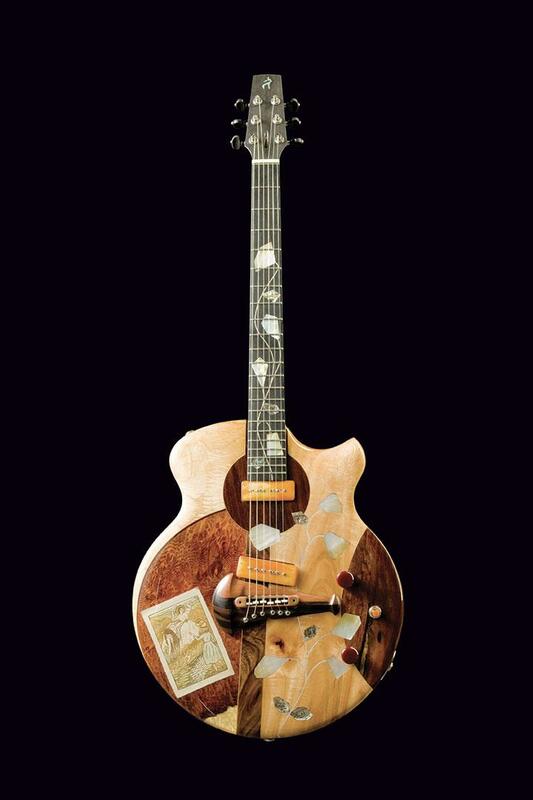 I thought it might be interesting to do something similar by wedding original Art Nouveau art with the medium of Michael Spalt’s technique utilizing the shape of Klein’s acoustic guitars. 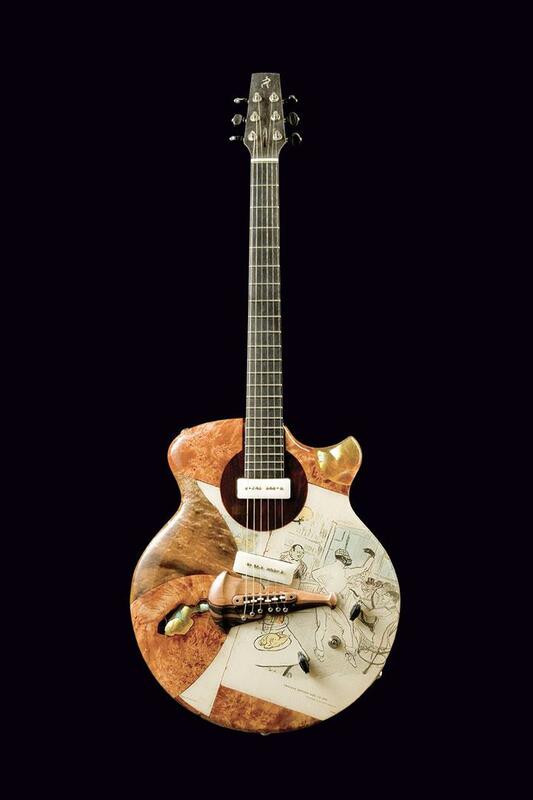 With the instrument I’d commissioned as a prototype, the concept for The Nouveau Series was born.